Replies: 2 (Who? ), Viewed: 568 times. What this tutorial will do: Show how to create an emission map in GIMP and add it to a CAS item using CAS Tools. Assumes you know how to use GIMP. 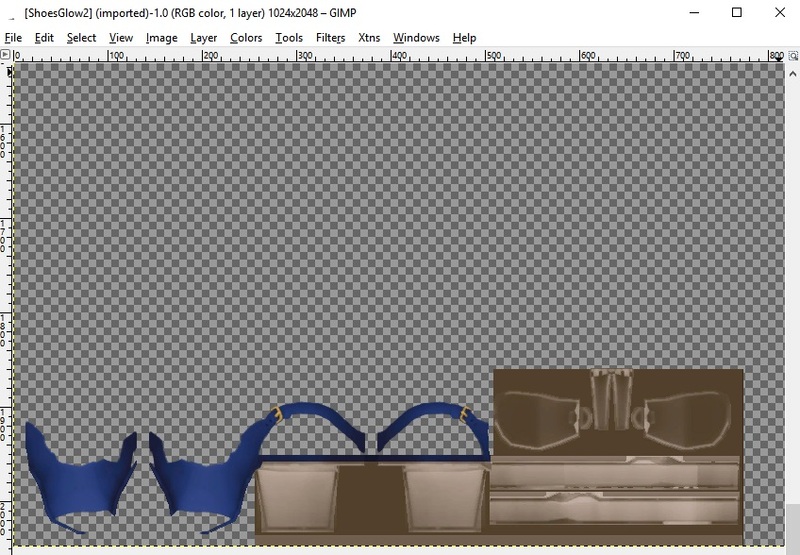 Any image editor that handles the alpha channel and imports/exports DDS can be used, the principles are the same. 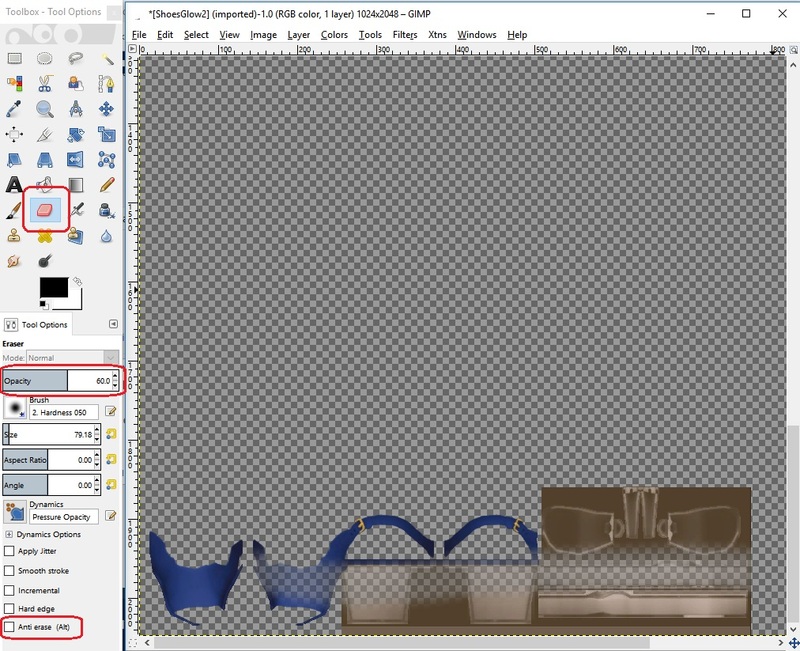 For this tutorial I'm going to make a clone of the EA PumpsPlatformSlingback and add a glow effect to the platform and heels. 1. 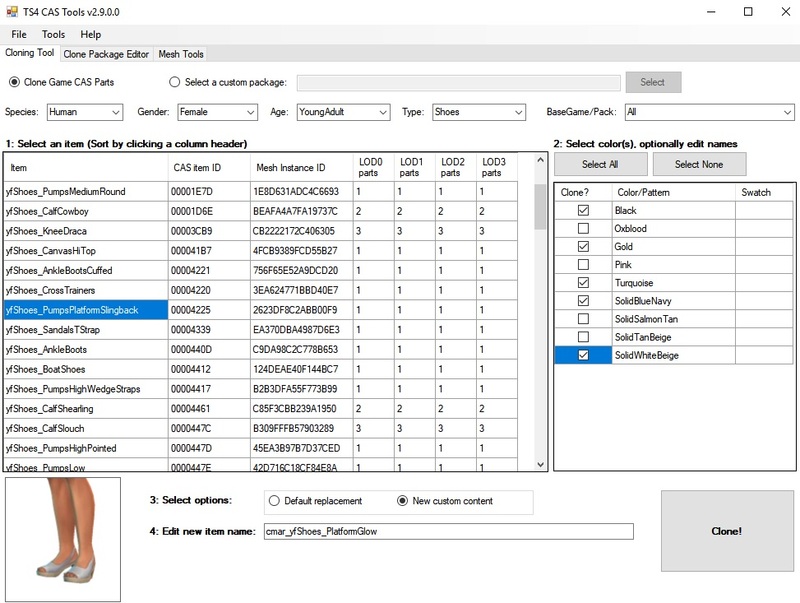 First, create the clone - open CAS Tools, set the species, gender, age, and type filters and click the 'Clone Game CAS Parts' radio button. When the list appears, select 'yfShoes_PumpsPlatformSlingback', select whichever swatches you want to include, change the item name at the bottom to describe your custom content, and click the Clone! button. 2. Go to the Clone Package Editor tab and open the package you just created. 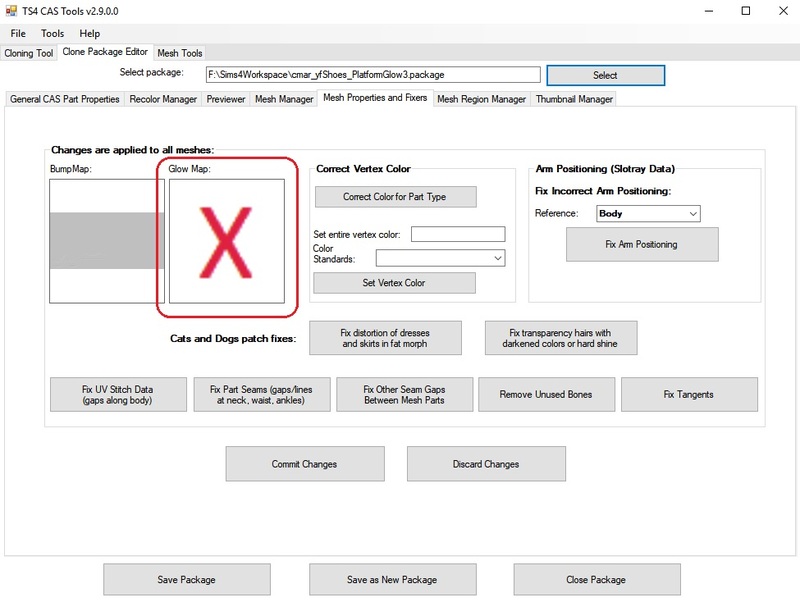 In the Recolor Manager tab click the texture and export it. 3. Open up the texture in GIMP and take a look. For these shoes you can see that the platform, heels, and bottoms of the shoes are the brown parts while the upper part of the shoe is blue. I want to make only the platform and heels glow. 4. 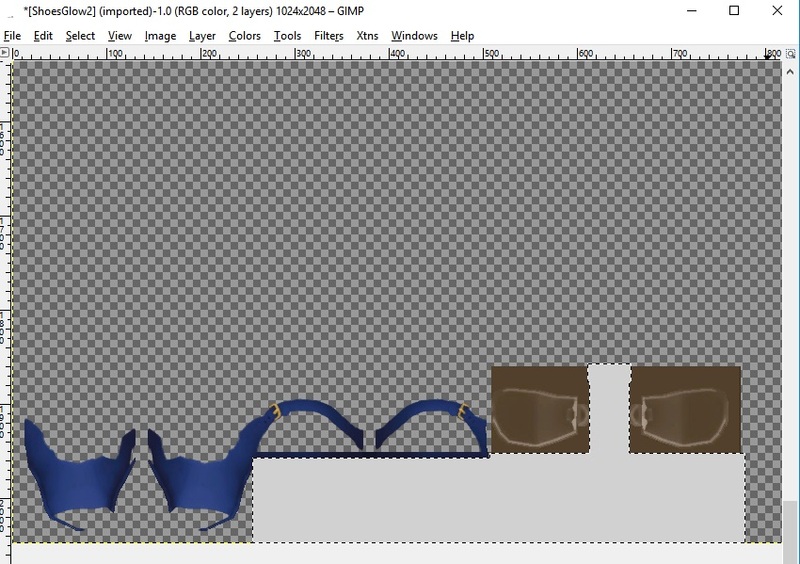 Add a new transparent layer, and select the areas for the platforms and heels. Fill the selection with whatever color you want the glow to be. I'm going to stick with a light gray but it can be any color or it can be more than one color. The brighter the color, the brighter the glow, and it will look brighter than the actual color you use - a light gray gives a bright white glow. 5. We may need to adjust the alpha, depending on the effect you want. No transparency gives a very fast blink. The more transparent it is the slower the blink, and at completely transparent it gives a steady glow. Delete the original texture layer. 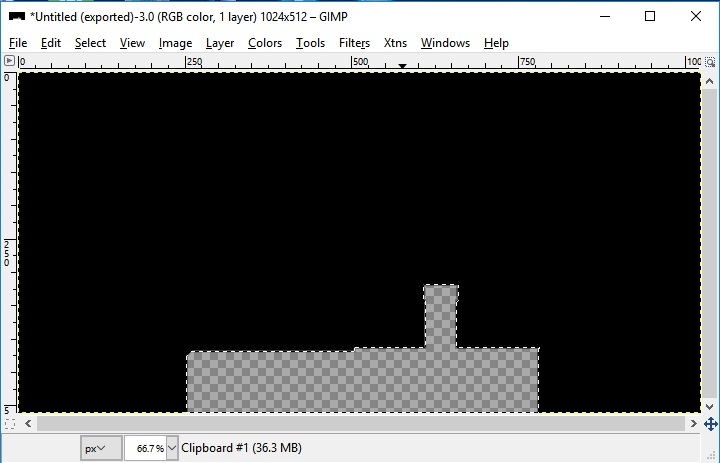 The game skips the part of the uv map that is above or to the left of the area for the particular part. If the texture is too big it'll be compressed and the glow won't show on the right parts. The easiest method I've found is to make a new image (File / New) with the needed dimensions, copy and paste the 1024 x 2048 image into it as a new layer, position the 1024 x 2048 image on it so they line up at the bottom and sides, right-click the pasted layer and click Layer to Image Size, and delete the new image's original layer or merge them. 7. Save as DDS, DXT5 compression, Generate MipMaps. 8. Import into your cloned package. 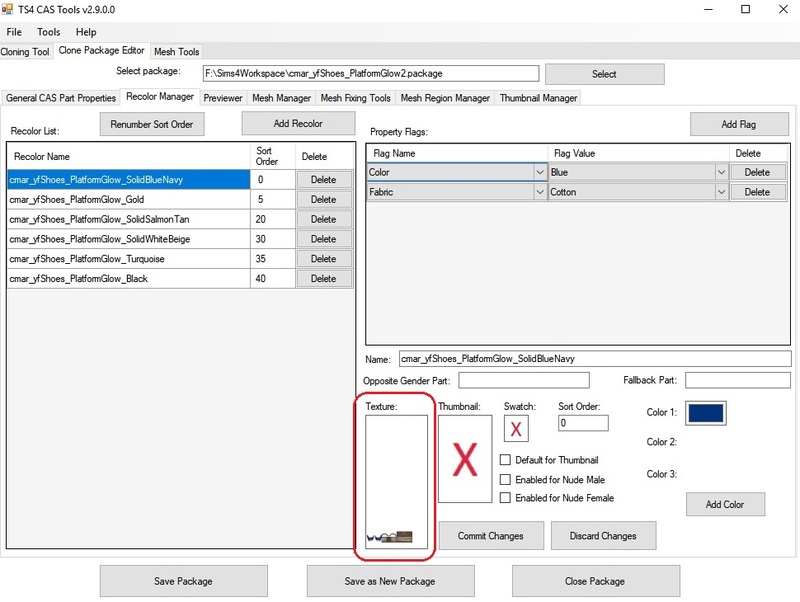 Using CAS Tools, open the package in the Clone Package Editor tab, go to the Mesh Properties and Fixers tab, click the Glow Map square, and import your DDS image. Click Commit Changes. If all has gone well, you'll see the glow in the Previewer tab. (It won't blink though.) Save the package. You can set the alpha in different areas to different transparencies to get different blink rates, and you can set the RGB color in different areas to different colors. I'm a little confused on the whole Alpha thing, I've only used Gimp to recolor things and never used the Alpha setting, could you describe how to do the Alpha stuff as simply as you can please? #3 24th Mar 2019 at 5:43 PM Last edited by CmarNYC : 24th Mar 2019 at 5:56 PM. The alpha channel controls how much transparency there is, much like the Red channel controls how much red there is, etc. Since you've done recolors you must have seen the checkerboard pattern in textures - that means alpha transparency. If you can see the texture through the checkerboard that means partial transparency. The easiest way is to just use the eraser tool and use the settings to control how much transparency you're applying. Eraser opacity of 100% will make full transparency, opacity of 75% will be 75% transparent, etc. In the pic below you can see the fully transparent areas and where I used the eraser at 60% to make a partially transparent area. You can make areas less transparent again by checking the Anti-erase option. - Click Colors / Components / Decompose and select Color Model : RGBA. - When you're done editing, click Colors / Components / Recompose.